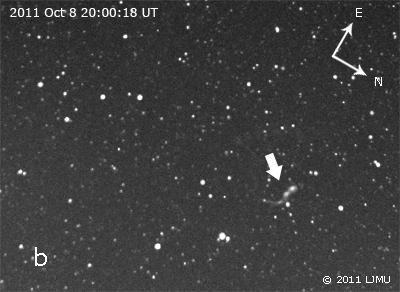 Geert Barentsen of Armagh Observatory recently used the LT to monitor the radiant of the Draconid meteor shower with RISE as the Earth flew through a particularly dense part of the meteor stream. 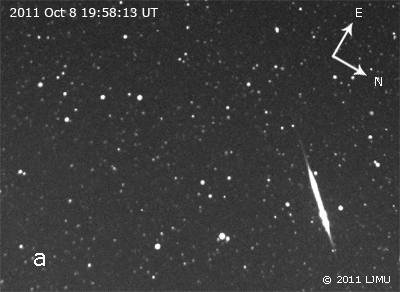 While a sharp peak in the number of meteors was seen for a couple of hours by observers in Europe and Asia, the LT's 20°-field-of-view SkycamT also recorded many meteors, most notably a bright fireball resulting in a spectacular ionisation train which persisted for at least nine minutes. 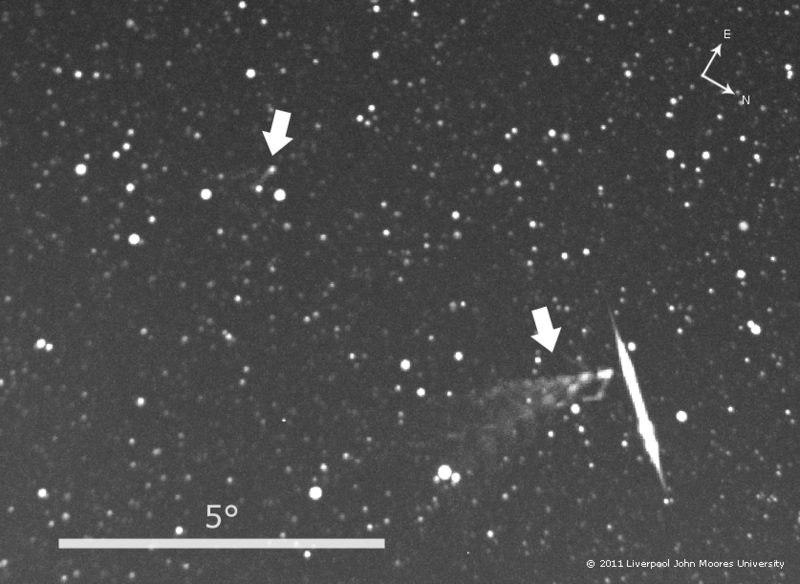 This meteor burst and train on 8th October were recorded over ten frames, three of which are pictured at right. 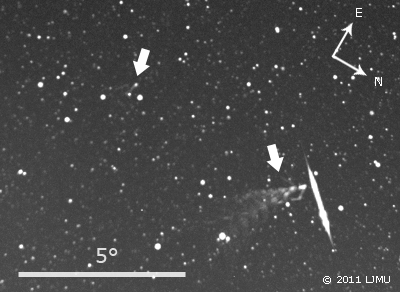 Frame (a) shows the meteor event itself, while frame (b), the third in the sequence, shows the debris cloud as 2-3 bright knots in the centre of the frame, drifting to the south west (arrowed). Five minutes later in frame c, the train has elongated into a long n-shaped form (lower right). Interestingly, what might be the fainter train from another meteor burst two frames earlier has also evolved into the same shape (upper left arrow). The beginning of this second event is not shown in this sequence, but is visible in the composite picture below and in the animation (3.1 MB). Composite image of all ten frames in the meteor train sequence captured by SkycamT. Note the smaller train which appeared halfway through the sequence, arrowed top left. Click image for bigger 61KB version. A fullsize animated GIF of the sequence is available here (3.1 MB). 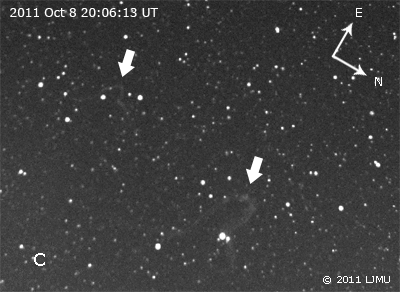 The 180° SkycamA, 20° SkycamT and 1° SkycamZ cameras are running continuously at 1 frame per minute on the telescope. SkycamZ data remains proprietary, but Skycams A and T provide valuable wide field and contextual data for any LT observers who want to make use of them. Though the data are available freely on-line we would encourage anyone accessing them to contact us so that we can better understand their usefulness to the community.